The Sponsorship Program identifies one or more promising artists or creative professionals who use technology in novel ways to inspire or advance the fields of popular visual arts including drawing, painting, photography, sculpture, videography and filmmaking. Selected individuals are sponsored for attendance at a major industry convention and networking event. 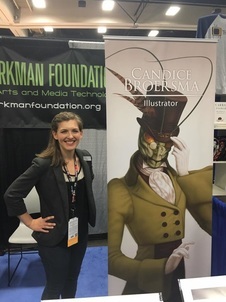 The sponsored individual is provided with an opportunity to display, sell, or promote their work at a booth on the convention floor, along with opportunities for meetings with other creators, artists, publishers, and notable professionals in their creative field. Please click here to learn more about the submission timeline and for the application form. GOOD LUCK! Micaela Dawn is an award-winning freelance illustrator. Her work has been featured in Spectrum 23 by Flesk Publications, Infected by Art 4, the covers of Victor Lavalle's Destroyer series and Saladin Ahmed's Abbott by BOOM! Studios, and several international galleries. In her spare time, Micaela has been developing projects that speak to her desire for equality and the promotion of women’s rights. Her main focus is creating bold, colourful works of art that have roots in fantasy and mythology. She also has a passion for developing art that comments on the continued need for diversity while helping empower women and minorities. Kelly McKernan is a fine artist and illustrator currently based in Nashville, Tennessee. Kelly obtained her Bachelor of Fine Arts from Kennesaw State University, with a concentration in drawing and painting. She has been exhibiting her work with numerous galleries since 2009, including notable spaces such as Gallery 1988, Spoke Art, Arch Enemy Arts, and Subtext Gallery. She also began her work as an illustrator in the same year and has worked on numerous projects, including album artwork. Kelly is also a member of the PRISMA Artist Collective and a current Grumbacher Featured Artist. Candice Broersma grew up in the quaint city of Yucaipa, California. She began her studies at a local art studio under the direction of artist Sharon Rachel, learning the basics of observational drawing over the course of seven years. As an undergraduate at the University of Redlands, she pursued her love of both music and art: painting by day and performing clarinet by night. Candice's involvement in the two fields gave her the opportunity to create recital posters, which introduced her to visual communication and design. Eager to delve further into the commercial arts, Candice decided to pursue illustration and consequently enrolled in the Masters program at the Savannah College of Art and Design. Since graduating, Candice has taken up residency at the prestigious Bovard Studio as a stained glass window concept artist and marketing graphic designer. David Boudreau, is a concept and caricature artist, as well as an accomplished animator. David was the recipient of the first SDCC Sponsored Artist program in 2014.